Here’s the news from around League One and Two today (1st March 2019). The report claims Statham is expected to leave the north-London club in the summer when his contract expires, where a host of clubs are already battling for his signature. 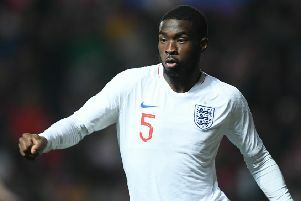 Nottingham Forest, Brentford and the Black Cats are all said to be monitoring his progress, however could miss out the youngster to Norwich City, who are reportedly leading the race. Despite the likelihood of the 18-year-old leaving Spurs, Statham has recently been spotted training with Mauricio Pochettino’s first-team. Portsmouth manager Kenny Jackett has revealed Nathan Thompson has delayed talks over a new contract. The right-back, whose contract is set to expire on June 30, is keeping his options open - although Jackett says the 28-year-old has indicated an interest in remaining at Fratton Park. Pompey had been hoping to tie up a new contract for the popular defender before the end of the campaign, talks having opened at the turn of the year. Gareth Evans is also out of contract in the summer, with the midfielder frustrated over the slow pace of his negotiations. Bolton Wanderers boss Phil Parkinson has played down talk of a sensational return to Bradford City, three years after departing. Parkinson had been installed as the bookies’ favourite after David Hopkin left Valley Parade before ex-Blackpool boss Gary Bowyer emerged as new frontrunner on Friday morning. Speaking ahead of Bolton’s trip to Swansea City tomorrow, Parkinson addressed those Bantams rumours: “There’s no truth in that. Luton Town and 2020 Developments have declared they are ‘delighted’ by the news that plans to build a mixed-use development were given a positive recommendation by Luton Borough Council’s planning officer yesterday. The Hatters’ outline application for the site near J10 of the M1 will go before the Development Control Committee at the Town Hall on Monday, March 11, with members being advised by planners to back the scheme, subject to a number of conditions. Although understandably thrilled by the outcome, the Hatters’ board, who saw a new stadium at Power Court given the green light in January too, knows there is still plenty to do before they can begin fully celebrating. In League Two, Crawley Town have shot down a story ran by the Daily Mail that stated a Singapore Consortium were on the cusp of a takeover of the club. The report says that Qiang Bai, who owns vSport, a cryptocurrency platform backed by blockchain technology, was nearing a takeover worth around £7million. It stated vSport had looked into purchasing Blackpool but are keen on Crawley because of their location near Gatwick Airport. Notts County have been issued with a winding-up petition by HM Revenue and Customs. The Magpies said in a statement on their official website on Thursday that “supporters are assured that the matter will be settled in good time”. The club are bottom of Sky Bet League Two and were put up for sale in January by owner Alan Hardy. Hardy’s company Paragon Interiors went into administration on Wednesday.